If your school uses an LMS integration (like Blackboard, Brightspace, Moodle, etc.) 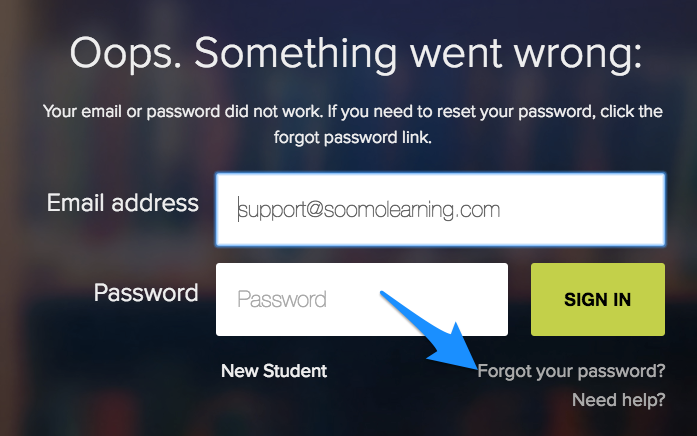 for students to log in, you don’t have a password. Go back to your course page and click the link. It should take you straight into your webtext. If you are supposed to log in through our website, you can find a “Forgot your password?” link on our main sign-in page, right below the Sign In button. Or you can simply click here to send yourself a password-reset link. Get in touch with us if you would like to know how to change the email address associated with your account.